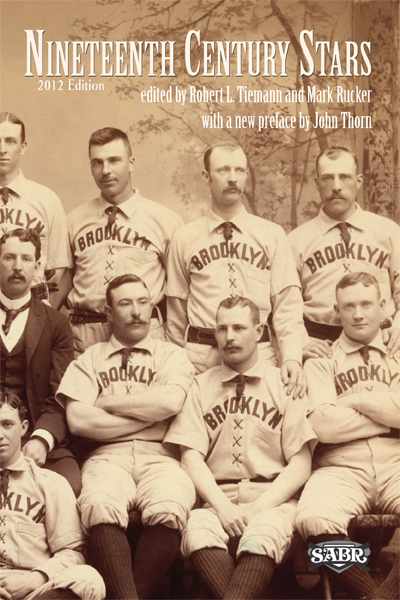 With almost 150 years of baseball history, the stories of many players from before 1900 were long obscured. The Society for American Baseball Research (SABR) first attempted to remedy this in 1989 by publishing a collection of 136 fascinating biographies of talented late-1800s players. Twenty-three years later, Nineteenth Century Stars has been updated with revised stats and re-released in both a new paperback and in e-book form. Baseball didn't begin as the strictly professional business it is today. Back in the late 1800s, the game changed rapidly: rules, teams, and even leagues varied wildly from year to year. From that primordial soup of competition, camaraderie, and commerce rose the game as we know it. Nineteenth Century Stars collects the biographies of 136 men from baseball's early era, the players and club members who played and shaped the game pre-1900. While some stars of the era have "name recognition" and inclusion in the National Baseball Hall of Fame, most would be unknown to modern baseball fans were it not for this book. Alongside Louis Sockalexis, Dummy Hoy, and Alfred Reach are the tales of Icebox Chamberlain, Lipman Pike, and Toad Ramsey. The photographs may be black and white, but the life stories can be quite colorful. These men were more than just baseball players: some owned businesses, others were doctors, one became an evangelist (and a few even became murderers). Nineteenth Century Stars is a labor of SABR's Nineteenth Century Committee. Founded in 1983, the committee first released the book in 1989. Since then, both SABR and the committee have grown more than ten-fold, and interest in baseball's origins has increased. Many wonderful new books on the era are appearing, but Nineteenth Century Stars remains one of the founding works of the nineteenth century baseball canon, including the works of many writers, including Robert L. Tiemann, Mark Rucker, John Thorn, Joseph M. Overfield, Paul Adomites, Richard Puff and L. Robert Davids. E-book: Click here to download your FREE e-book edition of Nineteenth Century Stars from the SABR Store. Available in PDF, Kindle/MOBI and EPUB formats. Paperback: SABR members, get a 50% discount off the paperback edition of Nineteenth Century Stars from the SABR Store ($15.99 includes shipping/tax). E-book: Click here to get the e-book edition of Nineteenth Century Stars for $9.99 from the SABR Store. Available in PDF, Kindle/MOBI and EPUB formats. Paperback: Click here to get the paperback edition of Nineteenth Century Stars from the SABR Store ($30.99 includes shipping/tax). For 40 years, SABR and its members have led the way in publishing the best baseball historical and statistical research. Our publications program is shifting to take advantage of new methods of publishing. Not only will we continue to publish new books like CAN HE PLAY? A Look At Baseball Scouts and Their Profession (released in December 2011) and OPENING FENWAY PARK IN STYLE: The 1912 World Champion Red Sox (released in May 2012), which showcase the best efforts of SABR's members, chapters and committees, but new technology makes it possible for us to bring out-of-print titles like RUN, RABBIT, RUN: The Hilarious and Mostly True Tales of Rabbit Maranville (released in February 2012) and GREAT HITTING PITCHERS (released in March 2012) back again. Books will be available in digital formats as well as paperbacks produced by "print on demand" (POD). This page was last updated October 31, 2017 at 10:10 pm MST.